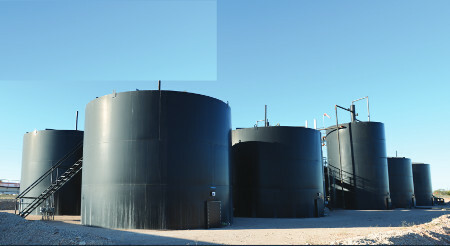 TSWR Development SWD Portfolio I DST intends to acquire several undivided fractional working interests in four fee simple salt water disposal facilities (including the Moreland SWD pictured above) located in Permian Basin Region of West Texas. (iii) sell the Properties within approximately 10 years. The Signatory Trustee anticipates that the Properties will provide the Investors with the potential for stable cash flow. The Moreland SWD salt water disposal facility in Midland County, TX. The Permian Basin continues to be the strongest region in the nation for oil production. The continued improvements in technology have allowed for consistent growth in oil production throughout the region. The Permian Basin is currently producing over 2 million barrels of oil a day, representing 21% of all US production. Even as oil prices have continued to soften as of late, production of oil and saltwater have steadily increased throughout the region. The Permian has had continued increases in daily production of oil since 2007. Although the rate of completions has slowed with the oil industry, production per well has increased with new wells producing on average of 400 barrels of oil per day. This increase of daily production has been steady per www.EIA.GOV statistics. In January 2013, Average production per new Oil Rig in the Permian Basin was 122 barrels of oil per day. In January 2016, the average new production was 416 barrels per day. Per statistics from the EPA, the average ratio of water produced/recovered per barrel of oil extracted is 10:1. Total Oil production for January 2016 is over 2 million barrels per day, creating a significant need to properly dispose of an average of 20 million barrels of water per day in the region in January 2016. The Permian continues to rule the U.S. oil production markets for two very simple reasons. First, the Permian has the largest oil reserves in the U.S., and, secondly, the infrastructure and support systems are in place to make drilling and extraction simple and lower risk than it has been historically. Even though drilling rig counts have dropped from 463 in January 2013 to 212 in January 2016, average production per well has increased 227%. The increases have resulted mainly from new horizontal wells that are being drilled under old producing vertical well fields. This new lower horizontal drilling strategy involves drilling mile-long horizontal wells that produce upwards of 3,500 barrels a day. The new giant wells in existing locations with existing infrastructure have caused average per well production to increase. In a slower market, this has caused some of the production in some areas slow and other areas to explode. The Permian Basin continues to be the most active and prolific region in the United States. Despite the decline in rig counts nationally, the ratio of rigs currently drilling in the Permian Basin has remained strong. New extraction techniques are driving the growth of oil production and activity in the region. This oil production creates an expanding need for salt water disposal. The Trust will enter into the Master Lease with the Master Tenant, an affiliate of the Sponsor. Under the Master Lease, the Trust leases the Properties to the Master Tenant for an original term of 10 years and the Master Tenant has the right, in its sole discretion, to renew the Master Lease for three additional terms of five years. WHAT IS A DISPOSAL WELL? A saltwater disposal well is very similar in structure to a producing oil or gas well. It has production tubing and casing like any other well. Instead of extracting hydrocarbons and water, these wells are used to dispose of the saltwater from other producing wells. The saltwater is injected into porous zones deep within the earth. These zones are able to absorb large amounts of water at reasonable injection pressures. Disposal wells are a critical component of the entire oil and gas industry. Most wells also produce large quantities of water in conjunction with the oil and gas that is produced. This water has to be disposed of in an approved facility. Water transport trucks load water from the storage tanks and haul the contents to a nearby disposal well. WHAT ARE THE ADVANTAGES OF OWNING A DISPOSAL WELL? A disposal well is different from a producing oil well because it does not deplete in production over time. A disposal well can improve over time because the wells around it will extract more water the longer they produce. The amount of water a disposal well receives can increase as more wells are drilled in the area. Rising oil prices can make the disposal well more profitable, since skim oil prices fluctuate with the price of oil. Longevity is a bonus for a disposal well operation. The oil well operator will separate the oil and water at their site, but the effort is not 100% efficient. At the SWD well, the operator will use a more sophisticated technique to skim the remaining oil. The average oil cut from the water is .25 to 1% per bbl.